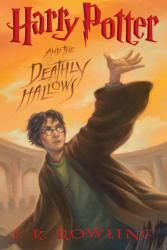 Harry Potter and the Deathly Hallows finishes off an exciting series that is one of the best of all time. In this book Harry finds out that he must kill Lord Voldemort and can only do so by finding his hidden Horcruxes. The book contains an astonishing ending and many characters fight for their lives. It also has twists, turns and plenty of action as Harry, Ron and Hermione run from Death Eaters on the quest to kill Voldemort. I would recommend this book for older readers and adults. Also, I would recommend reading the books before this one to understand what is going on in the story. It is an overall action-packed adventure. Harry Potter and The Deathly Hallows was a great book that I loved! In this book Harry, Ron, and Hermione all set of on a mission that Professor Dumbledore left Harry at the end of his 6th year at Hogwarts; to find and destroy the Horcrux's that Lord Voldermort has made to make himself immortal, or as close as he can get to it. As harry and his friends set out they discover that this will not be as easy as they had thought. As they find out how the Ministry of Magic has been infiltrated by he-who-must-not-be-named their mission just becomes more important. Can Harry and his friends do it and restore the magical community to the way it used to be? I suppose when I chose to read this book, it would have been a little more steampunk than it was. Sure, Boneshaker has some of the trappings of a steampunk story, like the Civil War and inventions comprised of brass; but in the end, it felt more like light window dressing than something important to the plot. Surprisingly enough, this book was more along the lines of a zombie apocalypse novel than a steampunk one. In that sense, I’m disappointed that the cover didn’t completely deliver on its premise and instead decided to rely on the tropes of the post-apocalyptic genre. The characters themselves were somewhat interesting, but their motivations seemed a little flat. The boy who wants to find his father and the mother who chases after him aren’t that compelling. In fact, the journey of both characters could have probably been accomplished via one of them, with supporting characters providing information about the other one. If anything, the plot was only used as a method to explore this semi-steampunk Seattle. This meant that, by the end of the book, there were quite a few more questions I had than answers. I guess that’s why there are two more books in this series. I think my main problem with this book is that it isn’t more thoroughly tied to real history and real locations. Sure, there were a few mentions of the Civil War, but if you removed those few links to history, the story stands on its own pretty well. In fact, you could probably set this anywhere, even in its own, unique world, and it should still work. Because it doesn’t rely on our knowledge of history and familiar places, it doesn’t feel like the “alternate history” that steampunk can provide. In the end, this was a pretty good idea, but it’s misleading in its marketing. 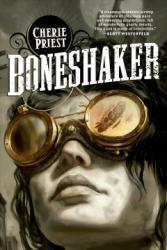 A post-apocalyptic zombie book that has hints of steampunk thrown in, I give Boneshaker 3.0 stars out of 5. 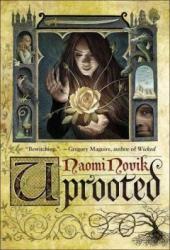 Uprooted by Naomi Novik was an interesting read - with magic and mythical creatures - but I found that in the first few chapters I stepped away from the novel several times. The beginning was slow with not much action, more setting up the scenery and the laws of the land than anything else. The novel follows a girl named Agnieszka living in a quaint village called Dvernik by a magic infested forest where every ten years a mysterious and immortal wizard called the Dragon, who lives in a nearby tower, visits to pick one woman as payment for protecting Dvernik from The Wood. Agnieszka is chosen to her surprise, but her interactions with the infamous Dragon are almost boring - they share a typical, overused trope in a love-hate relationship that frustrates the reader. The two are also locked away in the tower where there are minimal outside interactions from any other characters for almost the entire first half with the exception of one of Agnieszka‘s bedridden friends. I found that the last half of the novel was the most interesting because that was when other characters from the faraway capital were introduced and the scenes were more fast-paced. Because the world building aspect in the beginning was making me impatient, the problem was that later when Agnieszka returns to her village, I spent a long time away from there that the characters and their relationships were hard to remember and I personally did not care for them. There were definitely characters I met in the last half that I empathized or was absolutely lucid with and I did enjoy all the plot twists because, of course, they were unexpected and added some excitement to Uprooted. Overall, the beginning takes off one star for me due to the inaction and some common young adult tropes were utilized, but I loved most of the characters and the plotline anyway regardless of the latter. 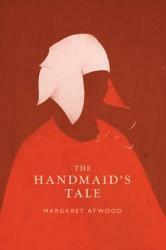 A fascinating and dark book. The premise is enjoyable. I adored the thought of a home for kids who went to other worlds. The kids could be summed up in one word: PTSD. And they were perfect, with complex backstories and hopes and dreams. The world's were even better, from the silent Hall of the Dead to the Moors, a world hovering between the lightning strike and the resurrection. I couldn't put the book down. In fact, I wish it was longer so I could spend more time in the rich world with its people. From a dapper mad scientist to a girl who ran on rainbows, they are all unique. And I love them for it. I love their interactions and their longing for the world's they had seen. The question was, who would murder to go back to the place they considered home. 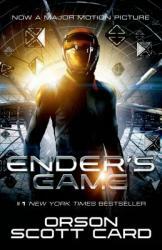 Ender's Game is an enthralling and thrilling sci-fi following a young boy as he is prepped to save the world. Ender departs for battle school at the ripe age of 6, where he is thrust into a world were children go head to head in a competition to be the best, fight in an all out war, and earn all the glory. Orson Scott Card writes with incredible dexterity and Ender's Game pulls you into a new world. I’m not sure which is more boring in a book: a plot that doesn’t go anywhere, or a main character who is perfect. Unfortunately, Fire with Fire has both. I’ll first start with my qualms about the plot. This story started way too late, as it didn’t get interesting until halfway through. Even when it did finally get interesting, it suddenly became bogged down in committee. Seriously? Didn’t we learn anything from the Star Wars prequels? Adding politics to a story about traveling across space merely makes it tedious. This is also not to mention how heavy and clunky the exposition is, with almost every chapter being filled with information that isn’t important, and the jumps between chapters needing way more explanation. Secondly, let’s take a look at “Mr. Perfect,” Caine Riordan. Aside from the egregious fact that the POV switched between 1st person and 3rd person within most of the paragraphs of his section (with no italics or indication that we were suddenly in Caine’s head), I felt this character was just the author’s way to show how smart he is. With the expansive repertoire of high-value vocabulary words and a character that always knows what to do all the time and has all the correct answers, I ended up not caring about any of it by the end. And I haven’t even mentioned the blatant and pervasive misogyny either. Even the rest of the supporting cast was so flat and one-dimensional that I probably couldn’t tell you who they were or what their defining characteristics were (aside from that one mysterious guy who LOVED olives and feta cheese). Most of the time I was reading this book, I kept wondering, “Wait . . . what?” as what seemed to be major plot points were introduced then almost immediately forgotten until hundreds of pages later. 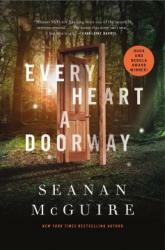 I’m not sure how this book managed to get a series tacked on to it, or how it was even nominated for a Nebula Award, but it gives me encouragement that I could write something way better than this. 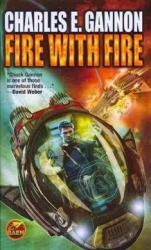 Antiquated sci-fi tropes in a recently written book, I give Fire with Fire 2.0 stars out of 5. 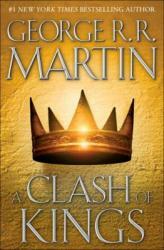 A Clash of Kings is the second book in Martin's A Song of Ice and Fire. 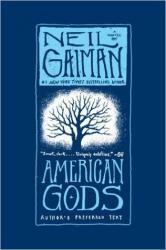 After adoring the first book, I was not at all disappointed with the second. The immensely complex fantasy world only continues to grow and develop in this book, as do the characters. George R. R. Martin perfectly juggles all the different storylines, making them all interesting, suspenseful, and fascinating. His characters are so 3-dimensional that characters the reader hates in the first book begin to be shown in a new light. I very strongly recommend this book to anyone that read A Game of Thrones. Every paragraph in this book is so richly embellished and detailed that as I read these books, I felt like I was learning the history of another country.